Are you ready to get started? I hope so, and I know you will love this little quilt when it is finished. The other thing I highly recommend is a design wall...and if you don't have one that's ok. It makes color placement much easier to see as we make each block. This weeks blocks are the Greek Cross....but wait, it looks like a Churn Dash! They are one in the same and made the same way. It is just a matter of color placement, and it is up to you. Since we are making three 6" blocks, I made one in the Greek Cross colorway. 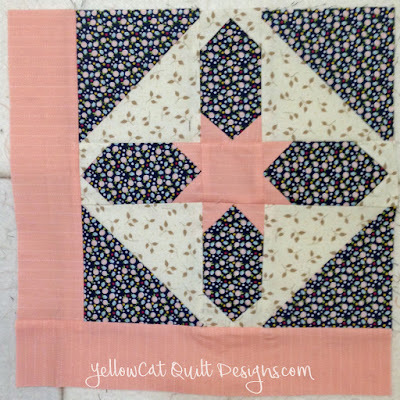 Check this post with an entire quilt made with the Greek Cross. Barbara Brackman states that there are at least 29 names for this block. Wonder what people were thinking as they named this block? It became quite popular in the 1930's and I can see a block made up in feedsacks, can't you? Your bonus block is the Goshen Star, and it is a 10" block that can be substituted for the 12" block. Wait you are saying....not to worry, I want to show you that you can incorporate a different size and make it work! My block is made with three colors, or you can make it with just two colors. (blue) Cut one 5" x 10" rectangle. 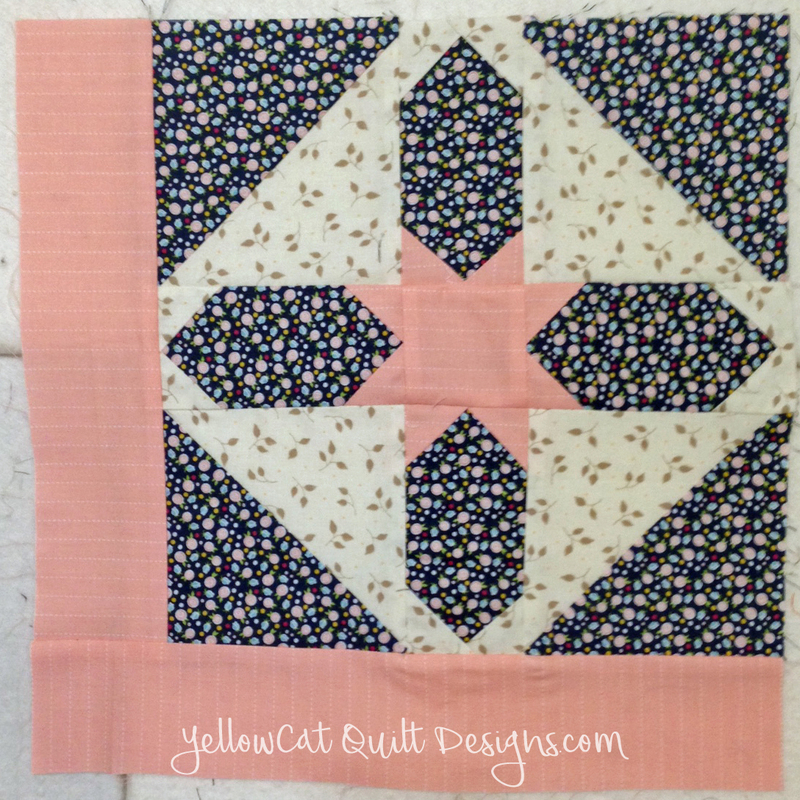 Subcut into two 5" squares. Cut in half once on the diagonal. Color two: Cut one 1 1/2" x 12" strip. Subcut into eight 1 1/2" squares. (white) Cut one 5" x 10" rectangle. 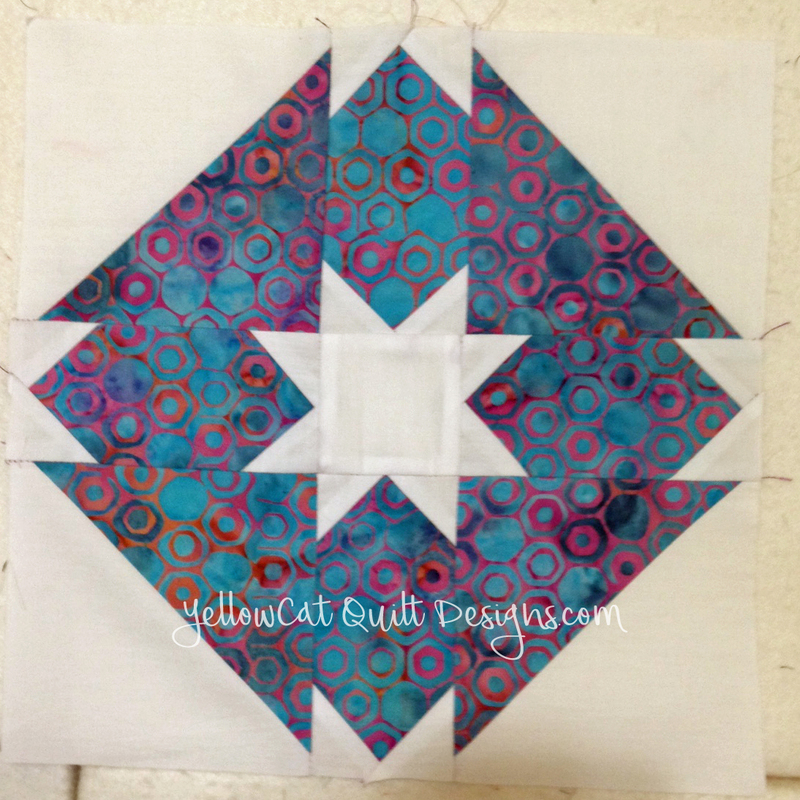 Subcut into two 5" squares. Cut in half once on the diagonal. (pink) Cut one 1 1/2" x 12" strip. Subcut into eight 1 1/2" squares. Cut one 2 1/2" x 10 1/2" rectangle. Cut one 2 1/2" x 12 1/2" rectangle. 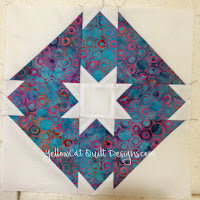 Sew the color one and color two triangles right sides together to make 4 HST. Press towards the dark. Trim to 4 1/2"
Sew the color two 1 1/2"" squares to the top corners of the Color one 2 1/2" x 4 1/2" rectangles as shown. 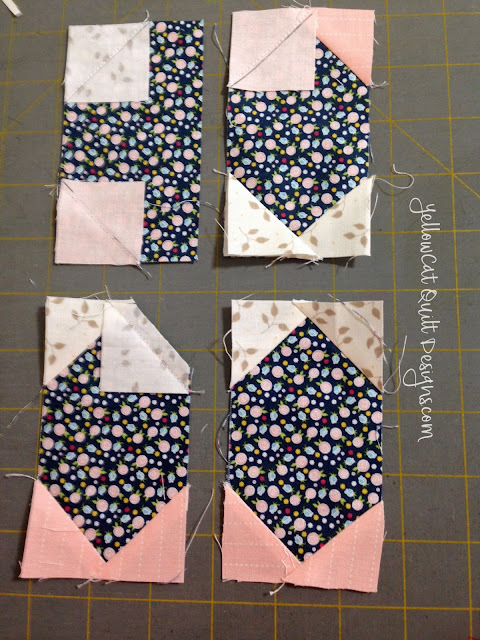 Sew the color three squares to the bottom corners of the rectangles as shown. You can draw a line diagonally or finger press to make a faint sewing line. You will sew....flip and press. I do not trim until I have flipped and pressed. This is so I can be sure my corners are accurate. Then I trim the bottom two layers of fabric. Sew one of the rectangle units to opposite sides of the 2 1/2" pink square. Press towards the center. Sew one of the rectangle units between two of the HST. This is where you need to pay attention to the way you place your HST...as you can see, the placement can give an entirely different look to your block. Play with it until you get the block you like. At this point the block will measure 10 1/2"
Now let's make this a 12" block. Add the 2 1/2" x 10 1/2" block to one side of the block. Then add the 2 1/2" x 12 1/2" block to the bottom. We are done with this weeks blocks. Please link your finished blocks in the linky provided at the bottom of the post. When you post you are in for the drawing for the weekly prize and for the grand prize....a $50 gift certificate from the Fat Quarter Shop at the end! It's fun to see what everyone is making, so please share.